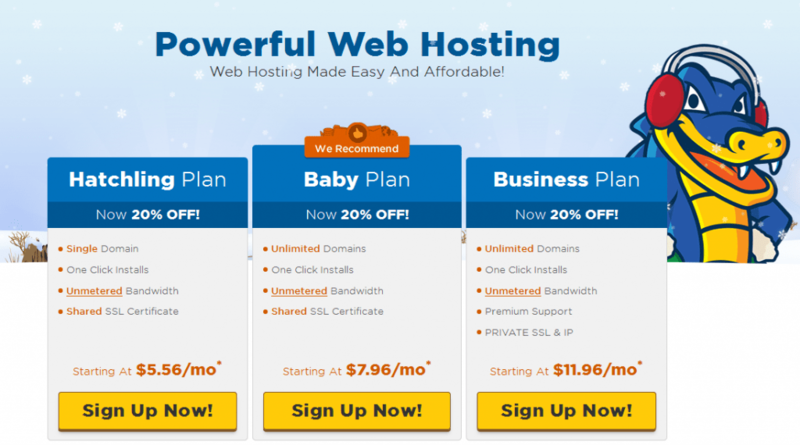 Hostgator Hatching, Baby, and Business Hosting Plan: What’s different? And which should you choose? Here’s a quick view on Hostgator Hatchling, Baby, and Business Plan. Figure below is the print screen from Hostgator website. Not much different, eh? Well on a closer look (referring table below), you can see that the three plans are quite different and this means a detail inspection before making any purchase decision is in fact necessary. So let’s check in details on each options. When you should go with Hostgator Hatchling Plan? Hatchling Plan is relative cheaper and it is the better option for those with only one website. However, in long term the Hatchling Plan is not very practical and I do not recommend any webmasters who are serious with their website to stay long with it. Think about it – domain name is so cheap nowadays that its cost is nearly neglectable when compare with other website operation cost. Do you think you will own only one domain for the rest of your time on Internet? Absolutely not! A new business idea, a forum for your hobby, a website for your family members, a charity website for the community, a personal blog – there are unlimited reasons for your second domains/websites. In fact, why limit yourself in one or two domains? Most webmasters, myself included, own (and operate) dozens of domains/websites and we are still buying domain names regularly! So, take the Hatchling Plan as the starting point in your Internet venture but never stick too long with it. ? When you should go with Hostgator Baby Plan? Answer: 99% of the time. The differences between Baby and Hatchling Plan is that Baby Plan is slightly more expensive and it allows unlimited addon domains; the main differences between Baby and Business Plan is that it doesn’t provide Toll Free Number, Anonymous FTP, and Chilisoft ASP*. So unless these extra features are absolutely needed, there is no reason why you should pay $60 extra every year for the Business Hosting Plan. *Note: You can add private SSL and dedicated IP features to your Hostgator Baby Plan with a little extra cost. When you should go with Hostgator Business Plan? Hostgator Business Plan is at its best value when you need all the addon e-commerce features (toll free number, dedicated IP, ChiliSoft ASP, and private SSL). It is most suitable for (well?) medium-large business websites owners that process their own money transactions. Do note that while I agreed Hostgator offers the Best Business Hosting, the Business Planis only recommended when you are going to use all those addon e-commerce. It’s not worth it to pay extra $60 per year if you only need an extra dedicated IP address or the private SSL. These features can be bought (at $2/dedicated IP address/year) or substituted with other web services (go with PayPal to bypass the need of a private SSL). Another question I got frequently from the readers: Can I upgrade/downgrade my Hostgator plan from time to time? The answer is absolutely yes. All upgrades with Hostgator (eg. Baby-to-Business, Shared-to-VPS, VPS-to-dedicated) are free of charge. All you need to pay is the prorated price after upgrades and you are done. On the other hand, downgrading to a lower level plan requires a $10 processing fees (which I think is reasonable). In case you have never heard about Hostgator, the hosting company is one of the top players and currently hosting more than 2.5 million domains. The company was founded in 2002 when Brent Oxley (HostGator’s founder and current CEO) started the company in his dorm room with about $1,000. At the time, Brent was a student at Florida Atlantic University and a webmaster and had a few extra servers, so he decided to make use of the servers and start a web hosting company. His side venture took off and Brent later dropped out of college to run it full time. Now, almost eight years later, the company that Brent founded in his dorm room occupies a four story office building in Houston and has more than 300 employees. Hostgator was voted as the fastest growing company in Texas (and ranked #21 in America) by Inc. Magazine’s Inc.5000 Awards in year 2008. If you haven’t read my Hostgator review, make sure you do so because it is one of the very few updated write-ups that reveal the reality; alternatively, you can always visiting Hostgator online at http://www.hostgator.com.